My post yesterday about web TV got me thinking about online video in general which is when I came across this piece on Press Gazette inspired by a study from researchers at City University into the use of video on UK news websites. Online video is an interesting proposition for newspapers in particular. The success of any online video venture – whether on a news site, or a dedicated web TV service – comes down to the quality of the content. That’s something newspapers have plenty of. 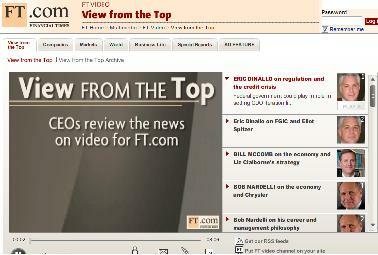 The FT in fact recently relaunched its video player and that channel is a key focus for the paper’s online ambitions, and has become one of its most popular sections, broadcasting hundreds of its own in-house made videos online each month. So on the face of it the newspapers have a winning forumla to give readers what they want. And that’s what it’s really about for the audience – not the novelty of being able to watch a video online, but being able to actually get the content they want, through the medium they prefer. The companies that succeed will be those who give readers the content they want, the way they want, and not the way the newspaper thinks they should consume it. Bearing that in mind, monetising Internet video is not a major challenge. Speaking to media buyers, pre-roll blindness and associated issues are not as big a problem as some might have you believe. If the Internet video content is worth watching, most viewers are willing to endure a reasonable (apparently at most 15 seconds) of pre-roll or equivalent advertising.